i asked on Twitter if all components are 24 volt, but didn't get an answer yet. 2.a. Josef Prusa mentioned that the power panic mode uses a hardware chip. The Ultimachine EINSY uses few components to measure the PWR-IN and BED-IN voltage and these are going to pins (93 and 88) of the Atmega2560. The Atmega2560 uses an output pin (6), which is connected to an IC 74LVC2G08, to switch/power off the bed and heater. So all the logic is done in the software, nice! 3.c. via a voltage regulator the VCC is 5v and this is used to power the rest like the PINDAv2, filament sensor, thermistors, etc. 4. Two of the P1 connector pins are different to the miniRambo. Which are TX1/RX1 and now used in the expansion (Rpi) J19 to make a second serial port available. Nice that the TX1 got a voltage divider to limit it under 3.3V! 4.a. Also nice that the expansion port J19 got the 'power panic' pin; thinking of Octoprint with fire-, what-ever sensors to switch of the heated bed and heater! 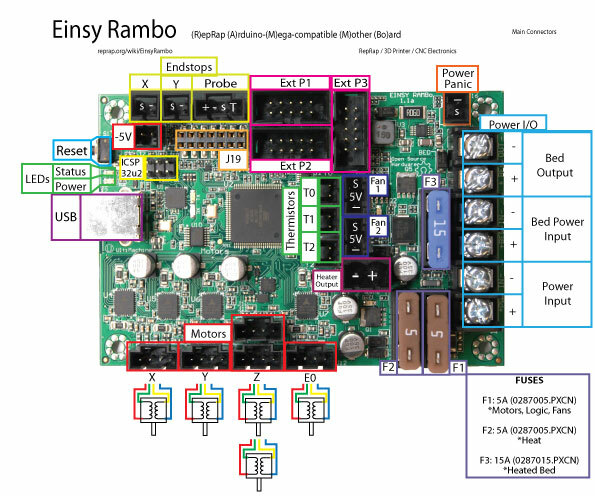 Only question i have is: Why does the EINSY still uses STEP,DIR and EN when everything can be done via SPI? Being backwards compatible? We will see in the Marlin firmware. I can't wait for the Ultimachine Archim 2 board which goes with a 32-bit and seeing Marlin 2.0 on that one. Maybe this is a really dumb question, but with what program did you open the schematics? And which ones? The ones from github? To view the actual schematics you need Altium Designer. It's, uhm, quite expensive. Stretches 'open source'. I suppose it could be the more affordable Circuit Studio, I'm not sure if there's a practical way to tell the difference without, well, owning one of them. *sigh*, 'letter' sized. Bloody yanks.. Does anyone know if the expansion connectors(p1,p2,p3) are used in the mk3? i am pretty sure that P1 and P2 will be used for the LCD screen/SD card reader and P3 for the Filament Laser Runout Sensor (i2c) and the MK3 Multi Material Upgrade kit. I was hoping to be able to attach led strips to the mk3 like tom did here. Any other idea where that would be possible? Couldn't you use the 5v plug next to the reset button?